If you don't start looking for a biostatistician co-principal investigator the same day that you start formulating your study question, you are a fool, and deserve neither funding nor a valid answer. If authors do not consider key methodological features at the design and execution phases of their study, they will have difficulties in improving the paper at the later scientific phases. — Erik Cobo, et al. Federal regulations and international standards require that IRBs review and approve human subjects research prior to initiation of a clinical research study. To do that, the IRB must make a number of determinations in order to ensure that the study meets all of the regulatory requirements for approval. 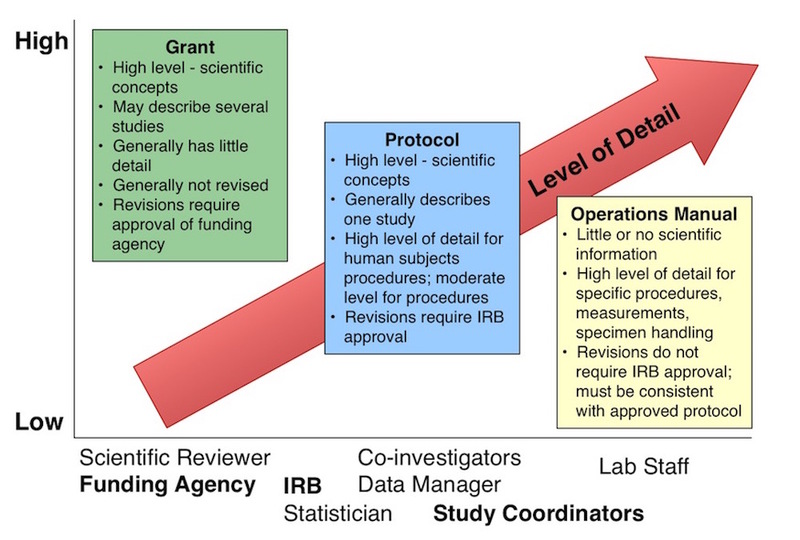 The protocol serves many purposes, one of which is to provide the IRB with all of the necessary information to ensure that the study will follow principles of sound scientific design and that the research will be conducted in accordance with federal regulations, state law and CHOP IRB and CHOP Research Institute policies. The Office of Human Research Protections (OHRP) has frequently cited IRBs for failure to require complete protocol information. For example, OHRP has cited IRBs for reviewing only minimal information regarding (a) risks to subjects and how they are minimized; (b) subject recruitment and enrollment procedures; (c) the equitable selection of subjects; (d) provisions to protect the privacy of subjects and maintain the confidentiality of data; and (e) additional safeguards to protect the rights and welfare of subjects who are likely to be vulnerable. See OHRP Compliance Findings for their most frequently cited compliance issues. Advice for writing protocols isn't strictly speaking, the IRB's responsibility. However, in reviewing the reasons for deferral or disapproval of research applications, the CHOP IRB has identified poorly written protocols as a major factor. The IRB has found that providing protocol templates and resources related to protocol writing reduces both the investigator's and the IRB's work and enables investigators to gain IRB approval more quickly. The protocol serves as the recipe for the conduct of the research activity. It needs to communicate all of the information that the following groups need to conduct their part of the study: the investigator and the investigative team, the data manager, the statistician and the IRB or other review body. Therefore, the protocol must include the scientific rationale to justify the conduct of the study, the information necessary to conduct the study, the plan for managing and analyzing the data, and a discussion of the research ethical issues relevant to the research. A complete, well-written protocol should address all scientific and research ethics issues so that the IRB does not need to request clarifications or to seek additional information. Study team can perform measurements in a consistent, reproducible manner. Appropriate comparators should be utilized and adequate numbers of subjects included to achieve the study objectives. Primary and secondary endpoints and plans for their analyses should be clearly stated. How is a protocol different than a grant? Many IRB submissions cut and paste information from the investigator's grant. This information provides much more scientific background information than is appropriate for a protocol and does not provide sufficient information regarding conduct and execution of the study. 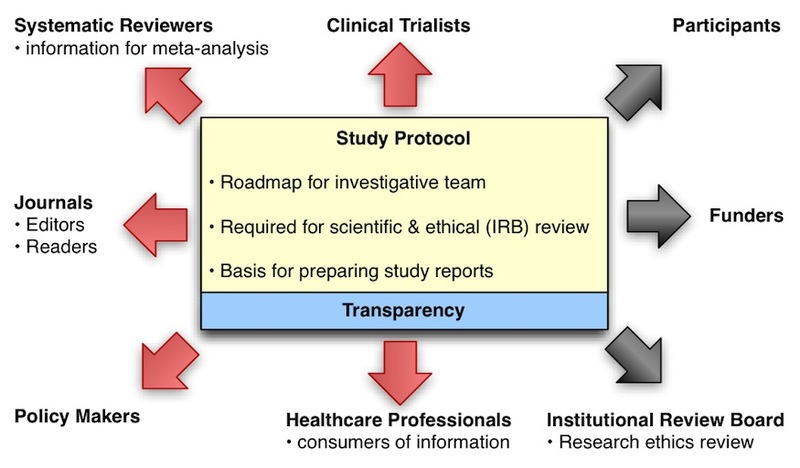 A protocol is a recipe that should enable anyone knowledgeable in clinical study execution to conduct the study; it is specific and detailed to ensure that the study will have fruitful results. At the other extreme, many protocols contain virtually no information and may be less than a single page. Many of the important scientific and ethical issues are not dealt with at all. Recipe containing the instructions for baking bread that includes a list of ingredients, measurements, and step-by-step procedures to be followed. To ensure that enough subjects participate to achieve the study objectives, the protocol should estimate the number of evaluable subjects needed. Some subjects will be recruited by decline to participate, some will consent but will be screen failures or will drop out. Only subjects who meet certain criteria (see below) will ultimately be included in the analysis of the study. It is important to estimate how many subjects will be lost during screening and during the study in order to have enough subjects at the end. The IRB may approve certain screening procedures without requiring prior informed consent (or parental permission and assent) of the prospective subject or the subject’s legally authorized representative under certain conditions. For additional information, see Recruitment vs Screening. Note that, even if consent does not need to be obtained for screening procedures, HIPAA Authorization may still need to be obtained if the requested data/stored biospecimens include PHI (the IRB's responsibilities related to HIPAA are described in more detail in the IRB's Role in HIPAA). If screening procedures are not limited to the procedures outlined on Recruitment vs Screening, then informed consent must be obtained before screening commences. If the investigator simply informs the prospective subject about the trial, this is recruitment not screening. Enrolled means all subjects who have consented to screening (if applicable) or participation in the main study. If the subject is a screen failure (ineligible), they are still enrolled. Subjects who fail to get the study intervention or to complete the required study procedures are still enrolled. Evaluable means all subjects whose data can be used in the final analysis data set. Subjects may be evaluable for some endpoints but not others. For example, if 4 blood samples are needed per subject to be considered evaluable in a PK study, all those who get the study drug but provide fewer specimens would be evaluable for safety outcomes but not the primary outcome (PK). The figure above is the required study flow diagram from the CONSORT guidelines. All subjects should be accounted for in the final study report and publication. The IRB provides several protocol templates on this page. They follow the format of typical NIH and industry multicenter protocols and the Observational and Intervention templates are ICH GCP compliant. None of the templates may be perfect for a particular research study and therefore, it is expected that the investigator will adapt the template to suit their needs. The descriptive protocol is intended for simple, descriptive research studies, particularly those limited to review of existing (retrospective) medical records. Do not use this protocol for more complex studies such as cohort or case-control designs. After developing the study question and identifying key collaborators (including a statistician), the first step in developing a well-written protocol is create a synopsis of the key elements of the study design. The synopsis and ultimately the protocol, need to follow the basic precepts for the type of research design that is chosen. While it may seem an obvious step, the majority of protocols submitted to the IRB do not have a succinct summary of the research design. Databases, registries (data banks), and repositories (tissue banks) all involve the collection and storage of information and/or biological specimens over time. Some registry/repositories serve diagnostic or clinical purposes, while others are solely for research. Many serve more than one purpose. Rapid advances, particularly in genomics have allowed registry/repositories to serve as tremendous resources for investigators. There are questions to be addressed that extend beyond those envisioned at the time of their creation. I'm an investigator for a multi-center study; do I need to write a CHOP-specific protocol?